East Fife won this important match courtesy of a late goal after the home team managed to come from behind to gain the victory when substitute Derek Riordan guided the ball into the near post from close range. Annan’s previous two displays were both won by fine second half performances but in this occasion after a good solid first half it was Annan who were over run in the second half by the Fifers who went for broke to secure the victory which very much keeps alive their chances of a play off position. Steven Logan got on the score sheet but it wasn’t enough on the day. Annan’s started the match without the injured Stuart McColm and Matthew Flynn, and within 7 minutes they also had the misfortune of losing Steven Swinglehurst who sustained a knee injury resulting in Steven Black filling in at the centre of defence and Rabine Omar being introduced. It was an early blow for Annan. Chances in the opening 20 minutes were few and far between without any clear cut chances being created. Omar did well in the 21st minute when he cut in along the bye line to finish with a low cross and at the other end Jonathan Page headed narrowly over after connecting with a free kick. Peter Watson had a good opportunity in the 26th minute when he connected with a corner kick but 2 minutes later Annan went ahead with a well constructed move. Omar did well to find Weatherson in the box and the experienced striker casually set up Steven Logan. Logan’s shot from 12 yards gave keeper Allan Fleming no chance. Julen Echaveguren’s 28th minute run eluded Watson and Chisholm down the left ending with a cross aimed at Liam Smith. Peter Weatherson shot over the bar with a 30 yard effort in the 33rd minute. Annan had Peter Watson to thank in the 37th minute when he cleared off the goal line after Austin’s effort struck the upright. East Fife finished the half strong forcing a couple of corners but Annan were solid at the back making it difficult for the home team. East fife lost the services of the injured Fraser Mullen at the start of the second half with Allan Walker taking his place. 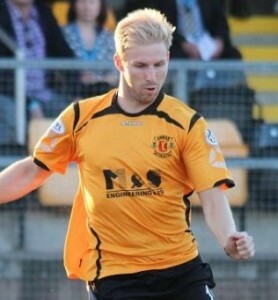 The home side were gaining momentum and Annan were being forced to defend deep. Jordan Hart pulled off an important save to deny Ross Brown and when Alan Cook headed past from a Sean Dickson’s cross the warning signs were evident for Annan. Nathan Austin scored the all important equaliser in the 65th minute when a long accurate ball played in from the right and over the head of Watson was well controlled by the striker who slammed the ball into the net from 10 yards. Andy Mitchell relieved some of the pressure in the 73rd minute with a brilliant strike from fully 35 yards which produced a fine important save from Fleming who managed to tip the ball over for a corner and from the corner Steven Black’s header narrowly missed the target. Annan appeared to have weathered the storm, and it was pleasing to see the introduction of the long term injury to Kenny Mackay when he was introduced in the 80th minute but it was East Fife’s substitute Derek Riordan who had the final say when he nipped in at the near post to guide the ball into the corner of the net from a low near post cross to earn his team the victory which very much keeps East Fife’s play off hopes alive. Annan are by no means out of the play off zone and with all the teams in contention to play each other the race for the play off zone is very much up in the air which should ensure an exciting run in to the business end of the season. EAST FIFE : Allan Fleming, Fraser Mullen(Allan Walker 49 min), Stevie Campbell, Ross Brown, Allan Cook (Derek Riorden 60 min), Nathan Austin (Ola Adeyemo 70 min), Gary Naysmith, Liam Smith, Julen Echaveguren, Sean Dickson, Jonathen Page. Substitutes not used Trialist, Scott Smith, Lewis Barr. ANNAN ATHLETIC: Jordan Hart, Keiran Brannan ( Steven Sloan 74 min), Steven Swinglehurst, Martin McNiff, Peter Watson, Steven Black, Andrew Mitchell, Steven Logan, Peter Weatherson (Kenny Mackay 80 min) ,Josh Todd , Iain Chisholm. Subs not used Alex Mitchell GK, Callum Cook, Chris Dickinson, Jordan Brown. REFEREE: Colin Steven Assistants Graham McNellie and Willie Ferguson.